'World Beat, World Rhythms for Drum Set' is a unique method and a special selection of World Drum Grooves collected by drummer Lucas van Merwijk during his musical encounters in South America, Africa, East Europe and the Middle East. Now, available as download with iBooks on your Mac or iOS device, World Beat contains great sounding drum grooves with more than 800 clear audio samples and Play Along Tracks with piano and bass. 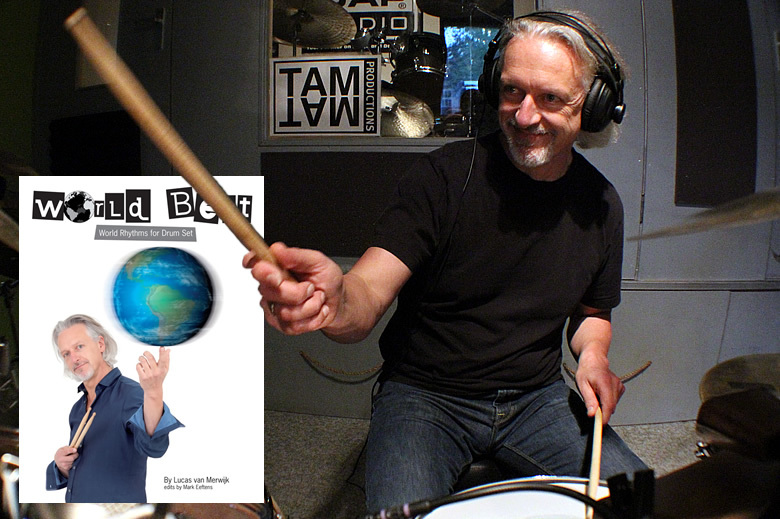 World Beat iBook contains a special selection of World Drum Grooves collected by drummer Lucas van Merwijk during his musical encounters in South America, Africa, East Europe and the Middle East. Download "World Beat - World Rhythms for Drum Set" here. "Lucas has written more than a drum book, it's a life journey! These are my favorite kind of books, ones that are more for reference and can be studied for a lifetime." "Lucas van Merwijk's educational book 'World Beat - World Rhythms for Drumset' is a walk on the rich road of world rhythms. Van Merwijk has the perfect mix of Cuban, Brazilian and North American rhythms, characterized by a powerful percussive sound and splendid technical skills."